This article is about the men's team. For the women's team, see Australia women's national soccer team. "Australia national football team" redirects here. For other uses, see Australia national football team (disambiguation). The first Australia national team was constituted in 1922 for a tour of New Zealand, which included two defeats and a draw. For the next 36 years, Australia, New Zealand and South Africa became regular opponents in tour (exhibition) matches. During that period, Australia also competed against Canada and India during their tours of Australia in 1924 and 1938 respectively. Australia recorded their worst ever defeat on 30 June 1951 as they lost 17–0 in a match to a touring England side. Australia had a rare opportunity to compete on the world's stage during the team's first major international tournament as hosts of the 1956 Melbourne Olympics. However, an inexperienced squad proved to be reason for the team's disappointing performance. With the advent of cheap air travel, Australia began to diversify its range of opponents. However, its geographical isolation continued to play a role in its destiny for the next 30 years. After failing to qualify for the FIFA World Cup in 1966 and 1970, losing in play-offs to North Korea and Israel respectively, Australia finally appeared at their first World Cup in West Germany, 1974. After managing only a draw from Chile and losses from East Germany and West Germany, the team which was made up of mostly amateur players was eliminated at the end of the first round, finishing last in their group without scoring a goal. It would prove to be the only appearance for the Australian team until the World Cup tournament returned to Germany more than three decades later in 2006. Over a 40-year period, the Australian team was known for its near misses in its attempts to qualify for the World Cup; they lost play-offs in 1966 to North Korea, 1970 to Israel, 1986 to Scotland, 1994 to Argentina, 1998 to Iran and 2002 to Uruguay. The team's previously poor record in World Cup competition was not reflected in their reasonable performances against strong European and South American sides. In 1988, Australia defeated reigning world champions Argentina 4–1 in the Australian Bicentennial Gold Cup. In 1997, Australia drew with reigning world champions Brazil 0–0 in the group stage and then defeated Uruguay 1–0 in the semi-finals to reach the 1997 FIFA Confederations Cup Final. In 2001, after a victory against reigning world champions France in the group stage, Australia finished the 2001 FIFA Confederations Cup in third place after defeating Brazil 1–0 in the third-place decider. Australia defeated England 3–1 at West Ham United's Boleyn Ground in 2003 as Wayne Rooney made his international debut. In early 2005, it was reported that Football Federation Australia had entered into discussions to join the Asian Football Confederation (AFC) and end an almost 40-year association with the Oceania Football Confederation (OFC). Many commentators and fans, most notably soccer broadcaster and former Australian captain Johnny Warren, felt that the only way for Australia to progress was to abandon Oceania. On 13 March, the AFC executive committee made a unanimous decision to invite Australia to join the AFC. After the OFC executive committee unanimously endorsed Australia's proposed move, FIFA approved the move on 30 June 2005. Australia joined Asia, with the move taking effect on 1 January 2006, though until then, Australia had to compete for a 2006 World Cup position as an OFC member country. After a successful campaign, the team took the first steps towards qualification for the 2006 World Cup. After coach Frank Farina stood down from the position after Australia's dismal performance at the 2005 Confederations Cup, Guus Hiddink was announced as the new national coach. Australia, ranked 49th, would then have to play the 18th ranked Uruguay in a rematch of the 2001 qualification play-off for a spot in the 2006 World Cup. 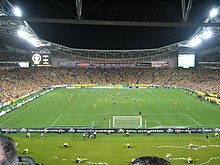 After a 5–0 friendly win against Jamaica, the first leg of the play-off tournament was lost (1–0), with the return leg still to be played in Australia four days later in Sydney on 16 November 2005. The second leg of the qualifying play-off was played in front of a crowd of 82,698 at Stadium Australia. Australia led Uruguay 1–0 after 90 minutes following a goal by Mark Bresciano in the first half. The aggregate was tied, and extra time was played. Neither team scored after two periods of extra time, bringing the game to a penalty shootout. Australia won the penalty shootout (4–2), making Australia the first ever team to qualify for a World Cup via a penalty shootout. Australian goalkeeper Mark Schwarzer made two saves, with John Aloisi scoring the winning penalty for a place in the World Cup, Australia's first qualification in 32 years. Australia went into the 2006 World Cup as the second lowest-ranked side. Although their ranking vastly improved in subsequent months after a series of exhibition matches against high-profile teams, including a 1–1 draw against the Netherlands, and a 1–0 win at the sold out 100,000 capacity Melbourne Cricket Ground against the then European Champions Greece. Led by coach Graham Arnold, Australia went to their first Asian Cup in 2007, sending a strong squad which included 15 players from the previous year's World Cup team. In Group A they played against Oman (1–1 draw), Thailand (4–0 win) and eventual champions Iraq (3–1 loss), assuring Australia's progression to the quarter final stage of the tournament. Though after drawing 1–1 with Japan after extra time, Australia exited the tournament on penalties at the quarter-final stage. An international friendly on 11 September 2007 against Argentina (1–0 loss) was Graham Arnold's last game as head coach, with the position eventually being filled by Pim Verbeek on 6 December 2007. Australia began their 2010 World Cup campaign in the third round of qualification, drawn into a group, composed of Qatar, Iraq and China PR, in which Australia finished first. Australia eventually saw progression through to the 2010 World Cup after comfortably winning the fourth round of qualification in a group consisting of Japan, Bahrain, Qatar and Uzbekistan. Australia's qualification was already assured before the final two games, finally topping its group ahead of Japan by five points. Australia were drawn into Group D in the 2010 FIFA World Cup, which featured three-time world champion Germany, Ghana and Serbia. On 14 June 2010, Australia faced Germany. Pim Verbeek's surprising decision to play without a recognised striker saw Australia comprehensively defeated 4–0. Verbeek received heavy criticism for his tactics, with SBS (Australia's World Cup broadcaster) chief soccer analyst Craig Foster calling for his immediate sacking. Australia's second group match against Ghana resulted in a draw of 1–1, and their third and final group match against Serbia resulted in a 2–1 win. Ultimately Australia's heavy loss to Germany saw them eliminated in group stage. Pim Verbeek completed his term as Australian coach at the end of the 2010 World Cup and was soon replaced by Holger Osieck. In 2010, Australia qualified for their second AFC Asian Cup, topping their qualification group. A successful campaign at the 2011 AFC Asian Cup saw Australia become runners-up to Japan, after losing in the Final 1–0 in extra time. In 2012, Australia agreed to compete in the East Asian Cup. Australia travelled to Hong Kong to compete in a series of qualification matches with the hopes of qualifying for the 2013 East Asian Cup. Despite handing several debuts and fielding an in-experienced squad, Australia was successful, finishing ahead of Hong Kong, North Korea, Guam and Chinese Taipei to progress to the 2013 East Asian Cup, where Australia eventually finished last behind Japan, South Korea and China PR. On 26 August 2013, Australia became full members of the ASEAN Football Federation but as part of their entrance agreement with the sub-confederation, their national team is barred from participating in the AFF Championship due to their perceived wide gap in football playing standards between Australia and the rest of the region. Australia's 2014 FIFA World Cup qualification began with a series of friendlies against the United Arab Emirates (0–0), Germany (1–2 win), New Zealand (3–0 win), Serbia (0–0) and Wales (1–2 win). Australia's World Cup campaign started in the third round of qualification, with Australia topping their group to progress to the fourth round. After winning their last fourth round-game, Australia finished as runners-up in their group, qualifying for the 2014 FIFA World Cup on 18 June 2013. Shortly after achieving qualification to the World Cup, Australia played a series of friendly matches against Brazil and France, suffering consecutive 6–0 defeats. This along with previous poor performances during the 2014 World Cup qualification campaign resulted in manager Holger Osieck's sacking, bringing his four-year tenure as Australia's manager to an end. After a two-week search for a new manager, Ange Postecoglou was eventually appointed in the position. Postecoglou was tasked with regenerating the Australian national team, which was deemed to have been too reliant on members of their Golden Generation of 2006, subsequently leading to a stagnation of results, culminating in successive 6–0 defeats to Brazil and France. In his first game as Australia's manager, a home friendly match against Costa Rica, Australia won 1–0 courtesy of a goal from Tim Cahill. For the 2014 World Cup, Australia were drawn in Group B alongside reigning Cup holders Spain, 2010 runners-up Netherlands and Chile. Their first match was off to a lacklustre start, having conceded two goals in the opening 15 minutes from Alexis Sánchez and Jorge Valdivia. Despite a goal from Tim Cahill that inspired a late resurgence from Postecoglou's team, they ultimately lost to Chile 3–1. Their second match against the Netherlands was a close one, but their efforts ended in a 3–2 loss, thus earning their early exit along with the Spanish team. Australian fans praised the team for their outstanding efforts in a tough group. In the end, Australia finished Group B with a third, consecutive defeat to former world champions Spain, 3–0. Australia's competitive World Cup performances in a difficult group lead to belief that a new Golden Generation was about to begin. In their first international match proceeding the World Cup, Australia played World Cup quarter-finalists Belgium in Liège, with Australia going down 2–0. Four days later, Australia achieved their first international win in ten months, and just their second win under Ange Postecoglou, with a 3–2 victory over Saudi Arabia in London. After drawing against the United Arab Emirates, and suffering successive losses against Qatar and Japan, combined with previous poor results earlier in the year, Australia slipped to 94 and 102 in the FIFA World Rankings, their lowest ever ranking. The new year saw Australia host the 2015 AFC Asian Cup, with the team making their third consecutive appearance in the tournament. Australia won their first two group matches against Kuwait and Oman comfortably, with scorelines of 4–1 and 4–0 respectively. This guaranteed their qualification for the knockout stage, despite losing their final group match against South Korea in Brisbane 1–0. They faced China PR in the quarter-finals and won 2–0, courtesy of a second-half brace from Tim Cahill. In the semi-finals, Australia won 2–0 over United Arab Emirates and advanced to the final for the second time in row. They faced South Korea in the final on 31 January at Stadium Australia, winning 2–1 after extra time to claim their first Asian title and qualify for the 2017 FIFA Confederations Cup. After Australia qualified for the 2018 FIFA World Cup, Ange Postecoglou resigned from his position as coach; and Bert van Marwijk was subsequently appointed as his replacement. On 8 March 2018, after van Marwijk's first squad announcement, the FFA announced that Graham Arnold will take the coaching role from after the 2018 FIFA World Cup until the 2022 FIFA World Cup. With van Marwijk, Australia was grouped with Denmark, France and Peru. The first match of Australia against future world champions France was praised by a valiant effort, in which Australia only lost 1–2 by a virtual own goal from Aziz Behich. After the defeat to France, Australia produced another outstanding performance, drawing Denmark 1–1. However, in the crucial match against already eliminated Peru, Australia lost 0–2 and crashed out from the World Cup with only a point, became the only team from the AFC to be winless in the 2018 FIFA World Cup. Subsequently, van Marwijk dispatched and Arnold came to replace him as new coach of Socceroos. Under Graham Arnold, Australia started their 2019 AFC Asian Cup in hope to defend the title, being grouped with Jordan, Syria and Palestine, but their hope was shattered by a shocking 0–1 defeat to Jordan. Australia soon returned to the race by beating Palestine 3–0 before won an important encounter with a hard-fought 3–2 win over Syria, eliminating both Palestine and Syria in process. The win gave Australia to qualify for the round of sixteen, where they overcame Uzbekistan after winning penalty 4–2, having drawn 0–0 for 120 minutes. In the quarter-finals, however, in the Hazza bin Zayed Stadium, the place where Australia had lost their opening match against Jordan, Australia once again failed to register any win in the same ground, losing to the host United Arab Emirates 0–1 due to a mistake from Milos Degenek, eventually failed to defend the title. Australian matches are broadcast by subscription sports network Fox Sports (including Asian Cup and excluding World Cup Finals matches) until 2022 and in 2018 by free-to-air network Ten on its 10 Bold channel until 2019. Previous coverage has been provided by ABC (Asian Cup Finals matches only), SBS until 2016 and Nine on its 9Go! channel from 2016 to 2017. The national team having set multiple ratings records for both subscription and free-to-air television. Australia's final 2006 World Cup qualifying match against Uruguay was the highest rating program in SBS history with an audience of 3.4 million viewers, while a 2010 World Cup qualifying match against Uzbekistan set a record for the highest subscription television audience, with an average of 431,000 viewers. The 2015 Asian Cup Final against South Korea had a total reach of 5.3 million Australians overall. Wikimedia Commons has media related to Australia national soccer team kits. Australia's first kit was sky blue with a maroon hoop on the socks, the colours representing the states of New South Wales and Queensland, a look that was reminiscent of the Australian national rugby league team's strips of the period. They wore the predominantly light blue kit until 1924 when they changed to green and gold. Australia have worn a yellow jersey, usually accompanied by green shorts, and yellow socks since the 1960s. The colour of the socks altered throughout the 1970s, 1980s, and 1990s from white to the same green as the shorts to the same yellow colour as the jersey. Their current away kit is a dark green/volt jersey accompanied by dark green shorts and socks. Australia's kits have been produced by manufacturers including Umbro, Adidas, KingRoo, and since 2004 by Nike. Rather than displaying the logo of Football Federation Australia, Australia's jersey traditionally features the coat of arms of Australia over the left breast. The team first wore the traditional green and yellow colours in 1924. Australia's 1974 World Cup kits were produced by Adidas as were all other national team kits in the tournament, with Adidas sponsoring the event. The kits, however, contained Umbro branding, due to the manufacturer's Australian partnership at the time. Nike renewed the kit manufacturer deal with FFA for another 11 years in 2012, handing them the rights to make national team kits until 2022. In the lead-up to the 2014 World Cup, the new kits to be worn by the team were revealed. The design of the new kits included a plain yellow shirt with a green collar, plain dark green shorts and white socks, a tribute to the 1974 Socceroos. Inside the back of the neck also had woven the quote, "We Socceroos can do the impossible", from Peter Wilson, the captain of the 1974 Australian team. This kit was well received. In March 2016, FFA revealed the new Socceroos kit, which featured a yellow jersey, yellow shorts and green socks. This was reportedly in accordance with a FIFA directive, instructing all national teams to have matching shirts and shorts. This kit was met with wide public contention, primarily due to the colour change of the shorts from the traditional green to yellow. but featured an Umbro logo. Nike 2004–present Current deal runs until 2023. Australia's nickname, "Socceroos", was coined in 1967 by Sydney journalist Tony Horstead in his coverage of the team on a goodwill tour to South Vietnam during the Vietnam War. It is commonly used by both the Australian people and the governing body, the FFA. The nickname represents a cultural propensity for the use of colloquialisms in the country. It also represents the Australian English use of the sport's name. The name itself is similar to most other Australian national representative sporting team nicknames; used informally when referring to the team, in the media or in conversation. Similarly, the name is derived from a well-known symbol of Australia, in this case the kangaroo. The words soccer and kangaroo are combined into a portmanteau word as soccer-roo; such as Olyroos for the Australia Olympic soccer team. 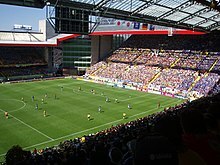 One of the matches of the 2006 World Cup was a group stage match between Australia and Japan at Fritz-Walter-Stadion in Kaiserslautern, Germany. Australia's long time rivals are trans-Tasman neighbours New Zealand. The two teams' history dates back to 1922, where they first met in both their international debuts. The rivalry between the Socceroos and the All Whites (New Zealand) is part of a wider friendly rivalry between the neighbours Australia and New Zealand, which applies not only to sport but to the culture of the two countries. The rivalry was intensified when Australia and New Zealand were both members of the OFC, regularly competing in OFC Nations Cup finals and in FIFA World Cup qualifications, where only one team from the OFC progressed to the World Cup. Since Australia left the OFC to join the AFC in 2006, competition between the two teams has been less frequent. However, the rivalry between the two teams is still strong, with the occasional match receiving much media and public attention. After joining the AFC, Australia began to develop a fierce rivalry with fellow Asian powerhouse Japan. The rivalry began at the 2006 World Cup, where the two countries were grouped together. The rivalry continued with the two countries meeting regularly in various AFC competitions including the 2011 Asian Cup final and qualification for the 2010, 2014 and 2018 World Cups. The main supporter group of the Australian national team is Socceroos Active Support (SAS). SAS was founded in January 2015 as an independent group, who uses social media to organise and keep in touch. This replaced the former active support group Terrace Australis, who were founded by Football Federation Australia and fans in 2013, during Australia's 2014 World Cup qualification campaign. Its establishment came in the wake of poor off-field action and minimal community engagement. Previously, the emergence of Terrace Australis saw the Green and Gold Army relinquish its role as a hub for active support, which it had claimed since its establishment in 2001. Since the 2015 AFC Asian Cup triumph, the supporters had encouraged people in Australia to focus more on the national team, and the nation's soccer pride. Australia does not have a dedicated national stadium, instead the team plays at different venues throughout the country for exhibition or tournament purposes. In recent years, major international matches have usually been rotated around various large grounds, include Stadium Australia and Sydney Football Stadium in Sydney, Hunter Stadium in Newcastle, Docklands Stadium in Melbourne and Lang Park in Brisbane. International matches have also been played at the Melbourne Cricket Ground and Melbourne Rectangular Stadium in Melbourne, Hindmarsh Stadium and Adelaide Oval in Adelaide, Subiaco Oval in Perth and Canberra Stadium in Canberra. Australia historically played at the Gabba in Brisbane, which hosted Australia's first international match on home-soil on 9 June 1923. Other historic venues which regularly hosted international home matches include Olympic Park Stadium in Melbourne as well as the Sydney Cricket Ground, Sydney Sports Ground and Sydney Showground. In England, the Socceroos have also played several "home" games previously at Craven Cottage in Fulham (Fulham Football Club's home ground), and Loftus Road, Shepherd's Bush (Queens Park Rangers' home ground), owing to the fact there is a large Australian expatriate community in West London, and that a high proportion of the senior team play in European leagues. For all past and present players who have appeared for the national team, see Category:Australia international soccer players and List of Australian international association football caps. The following players were named in the squad for the 2019 AFC Asian Cup. Caps and goals correct as of 25 January 2019, after the game against United Arab Emirates. The following players have also been called up to the Australia squad within the last 12 months. The following matches were played or are scheduled to be played in the current or upcoming seasons. Mark Schwarzer holds the record for most Australia appearances with 109. Tim Cahill is second place with 108 caps, followed by Lucas Neill with 96 caps and Brett Emerton with 95 caps. Tim Cahill is Australia's highest goalscorer, with 50 goals since his first appearance for Australia in March 2004. Damian Mori (29 goals) and Archie Thompson (28 goals) complete the top three. Australia currently hold the world record for the largest win and the most goals scored by a player in an international match. Both records were achieved during the 2002 FIFA World Cup qualification match against American Samoa on 11 April 2001. Australia won 31–0 with Archie Thompson scoring 13 goals and David Zdrilic scoring 8. Two days before the 31–0 win, Australia broke the record for largest win with a 22–0 win over Tonga. With 13 and 8 goals respectively, both Thompson and Zdrilic broke the previous record jointly held by another Australian, Gary Cole, who scored seven goals against Fiji in 1981, and Iranian Karim Bagheri, who also scored seven goals against Maldives in 1997. ^ "World Football Elo Ratings". eloratings.net. Retrieved 11 February 2019. ^ "Aussie footballers smash world record". BBC Sport. 11 April 2001. Retrieved 10 June 2012. ^ "Australia Vs New Zealand 1922". OzFootball. Retrieved 27 April 2013. ^ a b c "Australian Socceroos". australiansocceroos.com. Retrieved 29 April 2013. ^ "1924 Matches". OzFootball. Retrieved 29 September 2013. ^ "1938 Matches". OzFootball. Retrieved 29 September 2013. ^ "Australia Vs England 1951". ozfootball.net. Retrieved 31 March 2016. ^ "1956 Olympics". OzFootball. Retrieved 12 December 2013. ^ a b "Timeline of Australian Football". NSW Migration Heritage Centre and Powerhouse Museum. Archived from the original on 17 December 2014. Retrieved 27 April 2013. ^ "The Forgotten Story of ... Australia's defeat to Fiji – Vince Rugari". the Guardian. ^ "Socceroo Internationals for 1988". OzFootball. Retrieved 27 April 2013. ^ "Socceroo Internationals for 1997". OzFootball. Retrieved 27 April 2013. ^ "Socceroo Internationals for 2001". OzFootball. Retrieved 27 April 2013. ^ Dan Silkstone (14 February 2013). "Socceroos win 3–1 against England". The Age. Retrieved 5 October 2017. ^ "Goal at last: Australia joining Asia". The Sydney Morning Herald. Retrieved 29 April 2013. ^ "Johnny Warren". worldwardiary.com. Retrieved 29 April 2013. ^ a b c "Goodbye Oceania, Hallo Asia Australia FINALLY gets its wish". Socceroo Realm. Retrieved 29 April 2013. ^ a b "Hope hinges on Guus Hiddink". People's Daily Online. Retrieved 29 April 2013. ^ "Australia crushes Jamaica". The Age. Retrieved 29 April 2013. ^ a b "Aloisi ends Aussie wait". FIFA.com. FIFA. Retrieved 8 October 2013. ^ "Uruguay 0, Australia 82,698". The Age. Retrieved 29 April 2013. ^ "From the Terraces: It's Us Against The World". Jay Nair. homepagedaily.com. Archived from the original on 25 October 2012. Retrieved 29 April 2013. ^ "G, it's a sellout for World Cup send-off". Herald Sun. 5 April 2006. Archived from the original on 10 April 2006. ^ "Australia 3–1 Japan". BBC Sport. 12 June 2006. ^ "A Beautiful Mind". The Sydney Morning Herald. Retrieved 7 January 2014. ^ "Australia Wins AFC Men's Team of the Year". refsroom.ausref.com. Retrieved 30 September 2013. ^ "Socceroos' golden generation has much to teach our youth". The Sydney Morning Herald. Retrieved 25 September 2013. ^ "Verbeek is new Socceroos coach". The Sydney Morning Herald. Retrieved 29 April 2013. ^ "2010 World Cup Qualification History: Group D". soccerlens.com. Retrieved 29 April 2013. ^ "Verbeek takes blame for Socceroos defeat". The Sydney Morning Herald. Sydney. 14 June 2010. ^ Hilferty, Tim (16 June 2010). "Craig Foster – sack Pim Verbeek immediately". The Australian. ^ "Holger Osieck named Socceroos coach". Fox Sports Australia. Retrieved 29 April 2013. ^ "Australia 0–1 Japan (AET)". Daily Telegraph. London. 29 January 2011. Retrieved 2 February 2011. ^ "Australia sets sights on East Asia Cup". The World Game. Special Broadcasting Service. Retrieved 29 April 2013. ^ "Rookie Socceroos selected for East Asian Cup". ABC News. Australian Broadcasting Corporation. ^ "Osieck: East Asian Cup was valuable". The World Game. Special Broadcasting Service. Retrieved 25 September 2013. ^ "Australia joins ASEAN Football Federation". Goal Ghana. 27 August 2013. Retrieved 30 October 2017. ^ Bossi, Dominic (31 January 2019). "Socceroos seeking entrance into 2020 Suzuki Cup". The Sydney Morning Herald. Retrieved 27 January 2019. ^ "Socceroo Internationals for 2011". OzFootball. Retrieved 29 April 2013. ^ "Super-sub Kennedy sends Australia to Brazil". The World Game. Special Broadcasting Service. ^ "Holger Osieck's contract terminated". Football Federation Australia. Retrieved 12 October 2013. ^ "Ange Postecoglou appointed Socceroos coach". Football Federation Australia. Retrieved 23 October 2013. ^ Andrew Webster. "World Cup 2014: Ange Postecoglou's Socceroos regeneration has FFA backing". Smh.com.au. Retrieved 20 February 2015. ^ "Positive signs emerge for Socceroos as bold new era begins in earnest". The Sydney Morning Herald. Retrieved 8 January 2014. ^ "Australia in nightmare 'Group of Death' for Brazil World Cup". The Sydney Morning Herald. Retrieved 8 January 2014. ^ "Exciting times for new golden generation: Milligan | Football Federation Australia". Footballaustralia.com.au. Retrieved 20 February 2015. ^ "Welcome our new 'Golden Generation' | Football Federation Australia". Footballaustralia.com.au. Retrieved 20 February 2015. ^ "FIFA rankings: Socceroos hit their first century as Japan emerges as Asia's top side". foxsports.com.au. Retrieved 19 August 2015. ^ "Asian Cup 2015: Outstanding Australia beats Oman 4–0 to secure quarter-final place – Asian Cup 2015 (Australian Broadcasting Corporation)". Abc.net.au. Retrieved 20 February 2015. ^ "Asian Cup: Australia wins first title with 2–1 extra-time win over South Korea". Australian Broadcasting Corporation. 31 January 2015. Retrieved 31 January 2015. ^ "Australia beat South Korea after extra time". BBC Sport. 31 January 2015. Retrieved 2 February 2015. ^ "Ange Postecoglou quits as Socceroos coach". The Guardian. 22 November 2017. ^ Howcroft, Jonathan (8 March 2018). "No surprises as Graham Arnold takes on impossible Socceroos job". The Guardian. ^ Howcroft, Jonathan; Howcroft, Jonathan (16 June 2018). "France 2–1 Australia: World Cup 2018 – as it happened". Retrieved 11 February 2019 – via www.theguardian.com. ^ "Football news: Andre Carrillo and Luis Advíncula both get an 8 as Peru cruise past Australia 2–0 on World Cup bow – Article – Sport360". sport360.com. Retrieved 11 February 2019. ^ "Australia bounce back from opening loss with easy victory". AS.com. 17 January 2019. Retrieved 11 February 2019. ^ Butterworth, Liam (16 January 2019). "Socceroos hold out spirited Syria 3–2 to progress in Asian Cup". ABC News. Retrieved 11 February 2019. ^ "Asian Cup 2019: UAE v Australia as it happened – UAE win 1–0 thanks to Ali Mabkhout strike". The National. Retrieved 11 February 2019. ^ "ABC TV to broadcast the Socceroos at Asian Cup". Socceroos. Retrieved 20 October 2018. ^ "Socceroos score record television audience". ABC News. Australian Broadcasting Corporation. Retrieved 29 April 2013. ^ "FOX SPORTS SETS NEW SUBSCRIPTION TV RECORD WITH SOCCEROOS LAST NIGHT" (PDF). Fox Sports Australia. Retrieved 11 November 2013. ^ "Socceroos score for ABC and Foxtel". Retrieved 2 February 2015. ^ "Wanganui – Birthplace of the Socceroos". austadiums.com. Retrieved 26 September 2013. ^ "Fashion and the game". Evening News. Sydney. 10 May 1924. Retrieved 22 February 2016 – via National Library of Australia. ^ "Nike's New 11-Year Socceroo Deal". Australian FourFourTwo. Retrieved 28 April 2013. ^ "FIFA World Cup 1974 Group 1". historicalkits.co.uk. Retrieved 27 September 2013. ^ "Nike renewed as FFA kit manufacturer". Retrieved 16 March 2014. ^ "Nike reveals Socceroos World Cup kit". Archived from the original on 16 March 2014. Retrieved 16 March 2014. ^ jorginho_94 (22 February 2014). "Socceroos back to basics with new strip". theroar.com.au. Retrieved 8 October 2016. ^ a b James Matthey. "People weren't impressed with the new Socceroos kit". news.com.au. Retrieved 22 March 2016. ^ a b James McGrath (31 March 2016). "Why everybody lost their minds over a pair of yellow shorts". theturf.com. Retrieved 8 October 2016. ^ James Maasdorp (22 March 2016). "Socceroos, Matildas release new kit: looking back at Australia's best and worst kits". abc.net.au. Retrieved 8 October 2016. ^ Michael Lynch (22 March 2016). "Socceroos, Matildas unveil new kits". smh.com.au. Retrieved 8 October 2016. ^ Mike Hytner (22 March 2016). "New Socceroos and Matildas strips unveiled to mixed reviews". theguardian.com. Retrieved 8 October 2016. ^ "Nike's New 11-Year Socceroo Deal". FTBL. Retrieved 11 February 2019. ^ "Origins of the Socceroos". Football Federation Australia. Retrieved 29 September 2013. ^ "O'Neill wants to lose Roos in the name of progress". The Sydney Morning Herald. Retrieved 26 September 2013. ^ "Soccer's Australian name change". The Age. Retrieved 26 September 2013. ^ Hill, Simon (1 October 2012). "Mainstream Aussie press finally adopting the term football as soccer seen as thing of the past". News.com.au. Retrieved 10 September 2013. ^ "National Teams". Football Federation Australia. Retrieved 23 November 2007. ^ "All Whites backing derby rivalry to get them through". nzfootball.co.nz. Archived from the original on 15 October 2013. Retrieved 30 September 2013. ^ "Tell us your top Socceroos-All Whites games as a precursor to another trans-Tasman showdown". Fox Sports Australia. Retrieved 30 September 2013. ^ "Socceroos Active Support Community". Socceroos Active Support. Retrieved 5 September 2015. ^ "About Socceroos Active Support". Socceroos Active Support. 31 January 2015. Retrieved 5 September 2015. ^ "Support new Active Support Group". Terrace Australis. 5 February 2012. Retrieved 5 September 2015. ^ "Super winter for Australian football". Football Federation Australia. Retrieved 29 September 2013. ^ "Introducing Terrace Australis, the new active support group trying to re-build Socceroos atmosphere". Fox Sports Australia. Retrieved 29 September 2013. ^ "Terrace Australis is born..." Australian FourFourTwo. Retrieved 15 June 2013. ^ "About". GGArmy.com. Green & Gold Army Pty Ltd. Retrieved 15 June 2013. ^ "Socceroo Internationals for 1923". OzFootball. Retrieved 23 April 2014. ^ Thomas, Josh. "Kenny Lowe joins Socceroos coaching staff". goal.com. Retrieved 29 December 2018. ^ "Caltex Socceroos squad for AFC Asian Cup UAE 2019™ finalised". Football Federation Australia. 20 December 2018. ^ "James Jeggo added to Caltex Socceroos squad for AFC Asian Cup UAE 2019™". Football Federation Australia. 24 December 2018. ^ "Apostolos Giannou added to Caltex Socceroos squad for AFC Asian Cup UAE 2019™". Football Federation Australia. 3 January 2019. ^ "Australian national football team records". Retrieved 13 January 2015. ^ "Australia national football team statistics and records: top scorers". 11v11.com. Retrieved 15 June 2014. ^ a b Davies, Christopher (11 April 2001). "Australia score 31 without loss in record win". Telegraph.co.uk. London: Telegraph Media Group Limited. Retrieved 5 August 2009. ^ "Samoans lose 31–0 – or was it 32–0?". The Guardian. 11 April 2001. Retrieved 6 October 2016. ^ "Tonga routed as Socceroos hit 22". The Telegraph. 9 April 2001. Retrieved 6 October 2016. ^ Lynch, Michael (12 December 2004). "The all-important Cole difference". The Age. Melbourne. Retrieved 4 August 2009. ^ "Iran fanatics keep close eye on the Valley". The Guardian. London: Guardian News and Media Limited. 30 December 2000. Archived from the original on 24 June 2009. Retrieved 4 August 2009.